I recently discovered WeekPlan, an online, weekly planner site that I wrote about in my Art Time Productions, Business Advice blog with the post, Time and Project Management for One. The planner is inspired by the book, "Seven Habits of Highly-Effective People" by S. Covey and, at week four of using it, is proving to be very good at increasing my daily productivity. I'm maintaining a weekly schedule of writing one article for each of my three blogs and still having plenty of time to devote to other projects as part of my daily plan. The trouble is, writing for this blog (which has always been my main blog), is proving to be quite difficult to find subject matter for on a weekly basis. I've always only written for this blog when inspiration hit or if I was enthusiastic about writing. So trying to maintain a regular schedule of writing for this blog when inspiration isn't knocking is something of a challenge. I can't write about what I do most of at the moment (Animation) because I made a separate blog for that - which is much easier to write for because I'm always doing something in that area. I can't really write about Art Business because I made a separate blog for that too. Again much easier to write for too because the topic is so specific. Writing about my painting is something I could do but I find this a bit bland from my point of view. That is, most of my painting is what it is and isn't really that enhanced by explaining the inspiration behind most of the work. 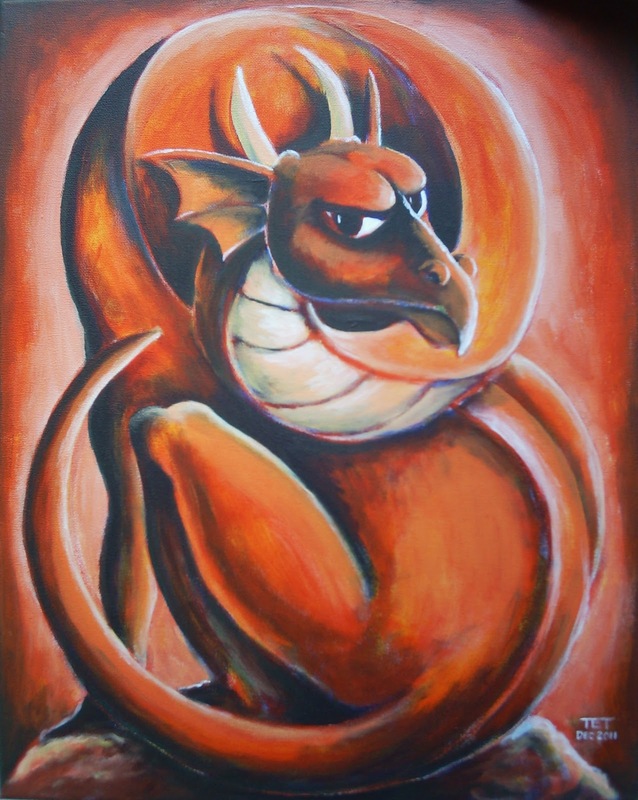 For example, I recently painted this Red Dragon (see image right). I've explained before that I like drawing dragons because you can make them look like anything and I particularly like posing them in really awkward positions. It doesn't get much deeper than that. There's no symbolism, no hidden message. I wasn't inspired by other dragon images... I just doodled a dragon in my sketch book and then turned the doodle into a painting. I've written about our pets before and I have no doubt I could easily devote my one article a week to the antics of Oscar, out pet dog. 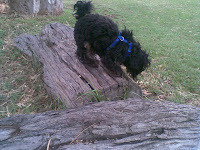 However I don't want to start looking like I'm an obsessive pet owner, infatuated with every little thing Oscar does. Yes, he is quite a character and yes I take him for a walk every day but for the most part he sleeps somewhere nearby whilst I'm being 'more productive'. If you've stuck with this article to this point you may realize that I'm really just waffling to get myself through this week's post. This is the kind of article I write when I don't know what to write. It beats staring at a blank page and is a tried and true method of breaking writers block... just write whatever you're thinking. I need to get back into the mindset that I had for a while where I would consciously look for things that might translate well into a blog post. Hopefully I can do that soon so you'll get some interesting and insightful reading instead of largely meaningless articles like this. At least I'm being more productive... right?